In late 2011 Daniel Bryan took advantage of Mark Henry and the Big Show and cashed in his Money in the Bank briefcase, winning his first World Championship. The odds were stacked against Bryan a short time later at the 2012 Royal Rumble as he defended the gold against both giants inside a steel cage. My son & I were there! Unlike the previous matches I've chosen for this series of blogs, this one did not really advance to much of anything else after it was over. 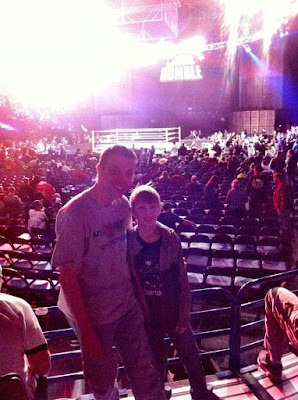 But I picked it because I'm a Daniel Bryan fan AND I was live in the crowd for this event with my 10 year old son. It was his first pay per view event and the first Royal Rumble I'd ever attended. This Rumble also marked the 25th anniversary for the event and featured the return of the inaugural winner "Hacksaw" Jim Duggan, but I digress. I should also note this was the best incarnation of the Mark Henry character through his career. I was big fan of his championship run leading to this match. My son wanted Big Show to win, I wanted Bryan to retain, which is what happened. Bryan was heelish in the match, and in the closing moments broke up Big Show's pin attempt on Henry. Then he scaled to the top of the cage only to be captured by Show. The champ struggled to escape and Big Show grabbed him again. Eventually Bryan dropped to the arena floor and gloated with the big gold belt in his hands. That may had been his most impressive win up until that point and only to be reinforced after he dropped the belt to the Rumble winner Sheamus in 18 seconds at WrestleMania 28. Obviously things would change in the coming years and Bryan would grow to be one of the most beloved Superstars of this era of wrestling.